Sold by Domoos and Fulfilled by Amazon. Gift-wrap available. 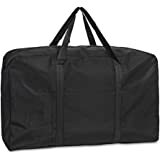 Amazon's Choice for "pillow travel bag"
LIGHTWEIGHT AND CAPACIOUS, extral large capacity, deep inside. 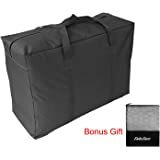 Double zippers work well and capacity is generous, durable and truly great for storing comforters, blankets, quilts, sheets, clothes, etc. and keeps them dry, clean. 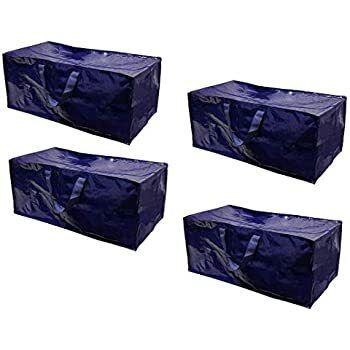 Size: 33"x 21.6"x 13"
Sold by Domoos and ships from Amazon Fulfillment. Sold by I WILL and ships from Amazon Fulfillment. 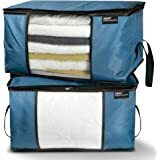 Domoos extra large comforter storage bag holds a lot and are quite sturdy. It’s 154L and holds weight up to 170lbs. It's great storage bag for almost anything. 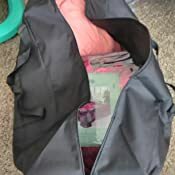 It's able to fit Full/ Queen size Blankets, Extra Large Blankets, Bath Towels, Quilt, Pillows, Mattress, Toys, Shoes, Clothes. 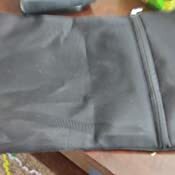 Easy to Slip the bag under bed, perfect for sliding toys in and out from the bed. 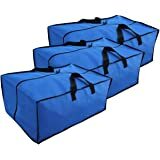 Perfect for College dorm Carrying Use, House-moving organization. 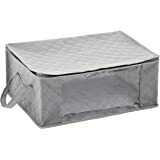 Use it to hold bed sheets, quilts, blankets, clothes, laundry, toys, pillows, comforters and store above cabinets/ in closet/ under bed to keep dust and dirt off the items. Add it to Cart now and get started to save your space! 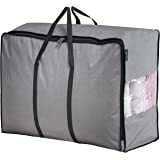 Extra Large Capacity, Washable, Foldable, Durable to Use for a long time! ●Why We Prefer Oxford Nylon? 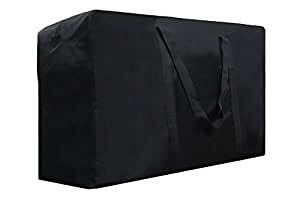 The extra large Reusable laundry bag is made of 600D oxford nylon. 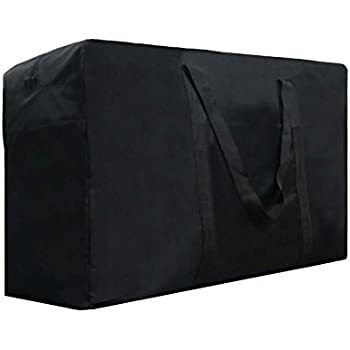 Unlike plastic comfortable bag, the fabric bag is breathable and has waterproof lining inside.
. 100% Money Back Guarantee. We always there to assist you with any problems or concerns. Simply contact us and we will be happy to address any of your concerns! 5.0 out of 5 starsBuy with confidence. For anyone thinking of buying this, I say go for it !!! 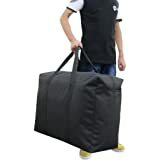 This bag is as large and sturdy as described. I have a small apartment and my quilts and pillows were taking up valuable shelf space. I was able to fit 2 queen size comforters, I queen size bed spread, 1 queen size blanket and 2 thick queen size pillows in here. I believe I could fit one more blanket if I had too. They all fit very well and I was able to put the whole thing on a top shelf in the closet. 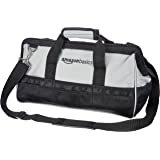 I am truly impressed with this bag. 4.0 out of 5 starsStraps could be stronger, but it's good! 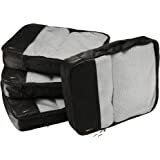 I purchased this to use for back and forth to the laundromat and it works great! Judging buy the photo, I thought there'd be more structure at the bottom/that it'd be flat, but it really is more like a duffle bag. I wish the straps were a little thicker/padded a little, but it isn't inconvenient to carry. 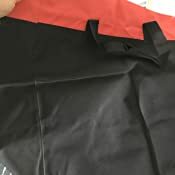 There seems to be a slight non-cotton lining on the inside, which I appreciate. This is just the ticket to store my fabrics that I use in my photo studio for backdrops and sound blankets, etc. Extremely roomy. 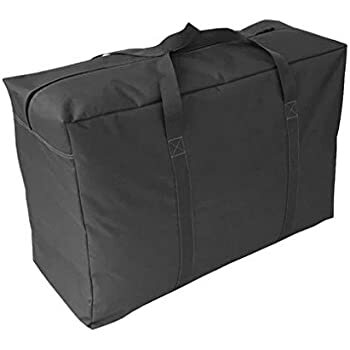 I keep it on a shelf most of the time so I can't speak to how durable it is for traveling, but it's certainly great to keep dust off my fabrics and to shuttle them as a stack around the set. 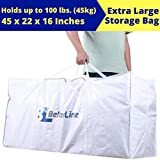 This wonderful storage bag arrived early and was just as described. 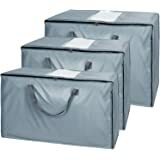 It is perfect to store winter clothes and keep them out of the way during the summer and will be used to store summer clothes in winter. Very large and sturdy. 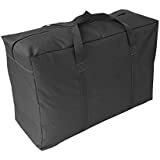 5.0 out of 5 starsWorth the price if you need to condense storage for travel! This bag is huge!!! That's what I wanted though. 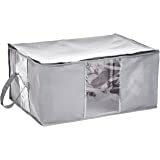 I used this for storing linens while I was camping. Worked perfectly. I was able to fit 1 comforter, 4 blankets, 4 pillows, 6 towels, and 1 sleeping bag. Using it for storage now. I know that this will come in handy when I need to move next. Large, lightweight, durable! 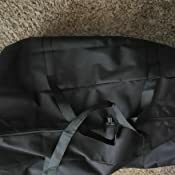 I needed a bag to put my Halloween decorations in and have in place for easy accessibility next year, and this bag is great! It is huge! A great purchase for me!! 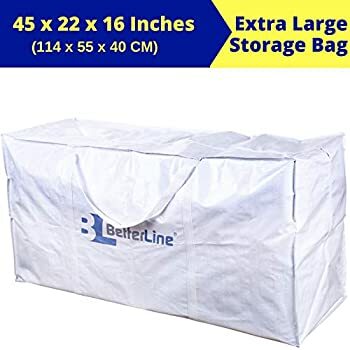 Also would be great for storing oversized items such as pillows, comforters, etc. Might be back for another one later to help me organize! This bag is amazing!! 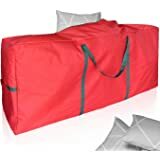 I have been searching for a bag that would fit my queen size mattress topper and this was perfect! It is made well, too. Material is Definitely not heavy enough to be used as a travel bag......atleast not in a commercial sense (airlines). Which is why i bought....oh well.... 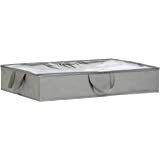 I will ultimately use it to store my comforter.